The owners of K and M Antiques, Margaret and Kenn Whitmyer, have been buying and selling collectible pottery and glassware since 1973. Like many dealers, we started out as collectors. 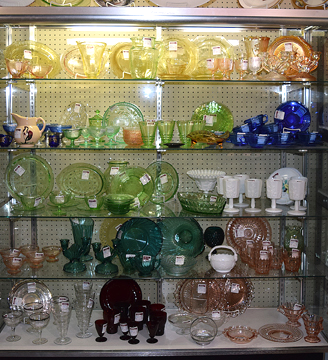 Depression Glass kitchen items and green Cameo were our passions. As our collection became more massive, it became obvious that we would have to sell some of our finds to help support our habit. Enter K and M Antiques, which began as a small flea market and mail order business. It rapidly grew into a full time enterprise. Our primary business at that point was selling at Depression Glass specialty shows, flea markets and operating a mail order business through publications such as the "Depression Glass Daze." During the late 1980s our business began to change and we found it advantageous to invest some of our time and efforts into some of the larger and more strategically located malls in the Ohio area. We are still located in three of these antique malls today. We invite you to view the photos of our mall booths below and get more information by clicking on "Links and Show Info" in the footer. 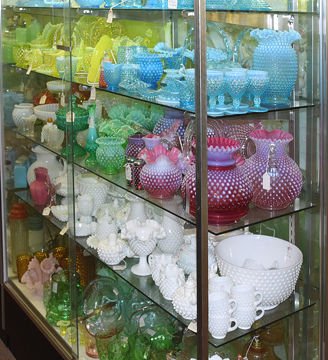 We have developed e-commerce sites via eBay, Ruby Lane,TIAS, Go Antiques, Cyberattic and Just Glass. We currently have an eBay store and maintain this web site. Our eBay store is called K & M Antiques & Collectibles. We also sell collectibles through eBay auctions using the name junquer9. "Fenton Art Glass 1907- 1939"
"Fenton Art Glass Hobnail Pattern"
"Fenton Art Glass Colors 1939-1980"
"Fenton Art Glass Patterns 1939-1980"
"The Collector's Encyclopedia of Hall China"
The Heart of Ohio Antique Center is one of the largest antiques and collectibles malls in the country. It features a massive 116,000 square foot enclosure playing host to 1400 booths and showcases that overflow with quality antiques and collectibles. There is also a 30,000 square foot exterior commons area brimming with outdoor furniture, architectural items and other durable primitives. Mo-Jo’s Café is open daily for lunch and refreshment. A customer lounge with a large screen TV is available for the relaxation of the weary and for the entertainment of less enthusiastic spouses. The mall is open daily from 9:30 a.m. to 6:00 p.m. with the exception of closure for the observance of Easter, Thanksgiving, and Christmas. You will find this mall located on the eastern edge of Springfield, Ohio at exit 62 of Interstate 70 at the junction of I-70 and US 40. 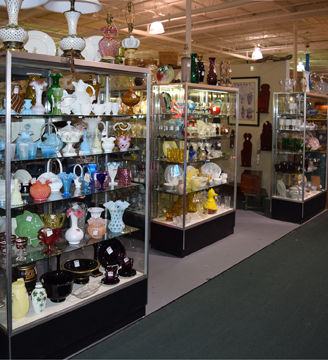 Our booths at the Heart of Ohio Antiques Center consist of open shelves and enclosed showcases that are rich with collectible china, glassware and pottery from the late 1800's through the years into the early 21rst Century. Examples of some of the items available are depicted in the photos below. This showcase features a mix of mid 20th Century opalescent Coin Dot and Spiral Optic glassware along with several colors of Crests. 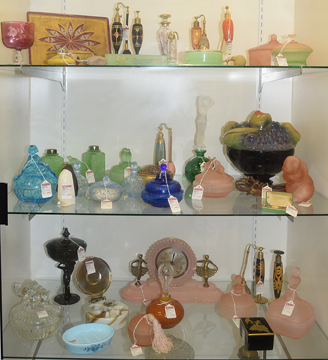 Notice several pieces in the Rosalene color and a few cased glass items in the foreground. The background is dotted with ruby colored glassware from the early 20th century. Figural glass containers for powder and scented products were popular during the Depression Era. Notice there was also quite an array of interesting bedside water bottles produced by numerous companies of the period. 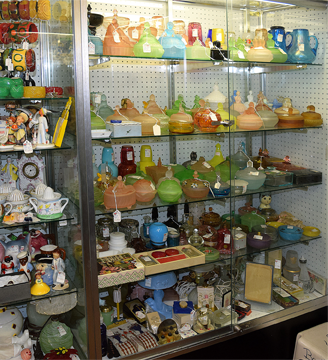 Open shelves are one of the most commonly used ways for antique mall dealers to sell commonly found dinnerware pieces. 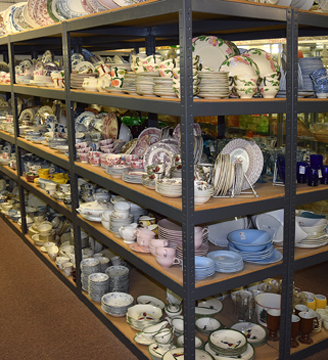 These shelves are loaded with English and American made china, pottery and other miscellaneous collectible items.. The Hobnail pattern was introduced into the Fenton General Line in 1940. It quickly became one of the company's best sellers in both opalescent and solid colors. The wide array of pieces that may be found contribute to its popularity on the secondary market. Springfield Antiques of Springfield, Ohio is located in two separate large buildings that offer over 50,000 square feet of enjoyment. Both of the mall locations are positioned on Titus Road near exit 59 of Interstate 70 on the southeast side of Springfield. This location is at the junction of I-70 and Rt 41. 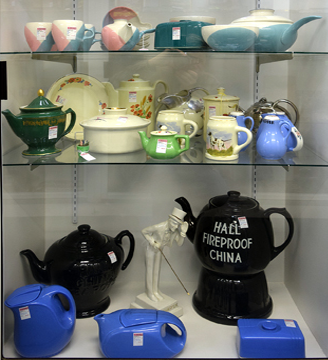 The malls have over 450 dealers who stock both showcases and open booths with quality antiques and collectibles. The larger building opened in 1994 and has been operating successfully for over 20 years. The smaller building was originally built and operated as an antique mall by another party for many years. This building was acquired by Springfield Antiques in 2014. Vending snacks and video entertainment are available in the lobby of the larger building. Both malls are open daily from 10:00 a.m. to 6:00 p.m. with the exception of closure for the observance of Easter, Thanksgiving, and Christmas. 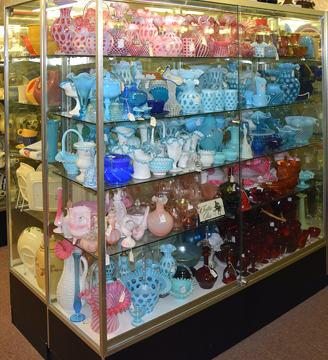 Our presentation at Springfield Antiques consists of open shelves and enclosed showcases that are filled with collectible china, glassware and pottery from the late 1800's to the early 21rst Century. Examples of some of the items available are depicted in the photos below. Hall China of East Liverpool, Ohio was one of the major producers of pottery dinnerware, kitchenware and restaurant ware for much of the 20th Century. Their ability to produce colorful uniquely designed teapots created a a enormous consumer market for interesting teapots. Collectors today appreciate the diversity and quality. Ohio pottery companies such as Roseville, Hull and McCoy produced many colorful consumer products during the first half of the 20th Century. Other American and European companies also contributed colorful creations that are very collectible today. As nostalgic collectors fondly remember their childhood, children's collectibles have become a favorite among them. 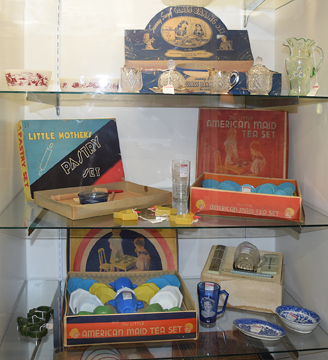 Items of interest include pressed glass sets from the late 1800's, lithographed tin sets, and glass and china sets from the 1920's through the 1980's. Original boxed sets are especially attractive. Tiffin, L. E. Smith and Devilbiss produced and decorated many glass containers for powder and scented products that were popular during the Depression Era. Lamps made during that era are still very much in demand today. Heritage Square Antique Mall is located north of I-70 on Brice Road on the east side of Columbus, Ohio. Over 400 dealers exhibit interesting merchandise in a 53,000 square foot facility. The mall is open Monday through Thursday from 10:00 a.m. to 6:00 p.m. Friday and Saturday hours are from 10:00 a.m. to 9:00 p.m. Mall hours on Sunday are from 12:00 noon until 6:00 p.m. Closed days are Easter, Thanksgiving, and Christmas. 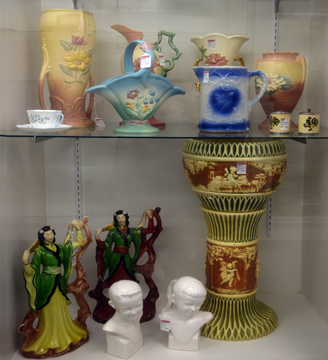 Our exhibits at Heritage Square Antique Mall consist of open shelves and enclosed showcases that are filled with collectible china, glassware and pottery. Examples of some of the items available are pictured in the photos below. The ability to produce colorful cheap machine-made glassware during the Depression Era kept many companies afloat. The patterns were numerous and today's collectors enjoy the varied selection. Fenton Art Glass of Williamstown, WV produced glassware accent pieces in opalescent and colored patterns for more than a century. Carnival glass patterns and stretch glass items were also made in their early years. 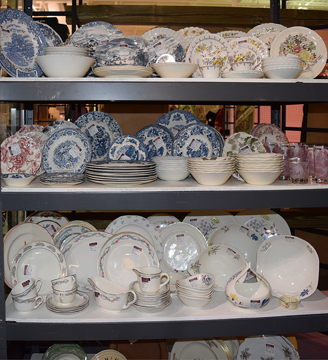 Open shelves are one of the most commonly used ways for antique mall dealers to sell commonly found dinnerware pieces. These shelves are loaded with English and American made china and pottery. 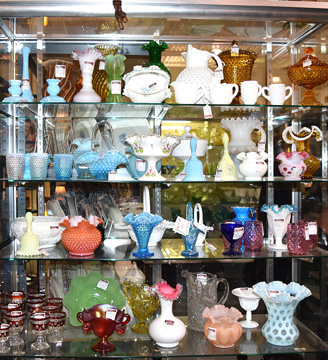 Our booth consists of open shelves and cases that feature china, pottery and glassware from the early 1900's through the early 2000's.